Book plates (also known as Ex Libris) are decorative labels attached to the inside of books. They are often little works of art and enhance the book not only by its decorative function, but as proof of its historic provenance. In the case of antique books ex libris bookplates can be used to establish who owned the book previously, which can be of interest to booklovers and collectors as well as an aid in scholarly research. The Latin phrase "ex libris" means "from the books of" or "from the library of" and so typically these kinds of labels will indicate the owber of the book by name or by means of a graphic design such as the person's coat of arms, or some other motif unique to that book owner..
Book-plates: printed or engraved labels pasted with-in the front covers of books to denote ownership. The use of the book-plate dates back certainly to the last quarter of the fifteenth century. The earliest specimens known were made and used in Germany. They are rude woodcuts of the archaic type familiar to the student of engraving. About the year 1480 Friar Hildebrand Brandenburg and Younker Wilhelm von Zell gave books and manuscripts to the Carthusian monastery at Buxheim, and upon some of these they pasted heraldic devices recording the gifts. These are the earliest attested book-plates known to-day. The claim has been made, but not established, that book-plates were in use in Japan in the tenth century. Early in the sixteenth century the art of the book-plate received great impetus from Albert Durer, who drew, if he did not actually cut in the wood, a number of undoubted book-plates. The first of these bearing a date was made for Hieronymus Ebner. It is dated 1516, and by its inscription, Liber Hieronimi Ebner, is clearly identified as a book-plate. Credit may properly be given to Durer for making the. book-plate what it is, for he transformed the crude drawing and rough wood-cutting of his predecessors into an artistic design, ingeniously devised and skillfully engraved on wood or copper. Bilibald Pirckheimer, the Nuremberg jurist, and Dr.
Hector Pomer, Provost of the Church of St. Laurence in the same city, had book-plates made by Durer. In the Imperial Library at Vienna may be seen the original wood block of an armorial design for John Stabius, which was probably a book-plate. 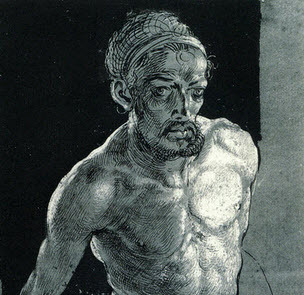 Bartsch ascribes it to Durer. This measures 11 by 7 1/2 inches. It is easy to be misled in looking over the armorial designs of Durer and other German artists into believing that all of them were intended for use as book-plates; but there were other uses for heraldic prints, and there is need of investigation before accepting them as genuine book-plates. Coats-of-arms of many of the leading families of Nuremberg, as the Kress, Scheurl, Rieter, Haller, and Kurtz, continually come up among the early prints to torment and puzzle the collector. Among the celebrated German artists who made book-plates may be named Lucas Cranach, Hans Holbein, Hans Sebald Beham, Jost Amman, Hans Siehmacher, Hans Troschel, Wolffgang Kilian, Virgil Solis, Giles Sadeler. All along through the sixteenth and seventeenth centuries book-plates are numerous and of considerable merit as works of art. In the eighteenth century the most eminent engraver whose name appears on these small engravings is Daniel Nicolas Chodowiecki. The plates made under the supervision of Durer seem to have been the first embellished with non-essential but highly artistic and desirable ornamentation. Ever since his day the ornamentation of the book-plate has been considered an important feature, and as this ornamentation conforms to the changing conditions, views, and tastes of the different nations, the student of book-plate art finds certain natural classifications ready to his hand. 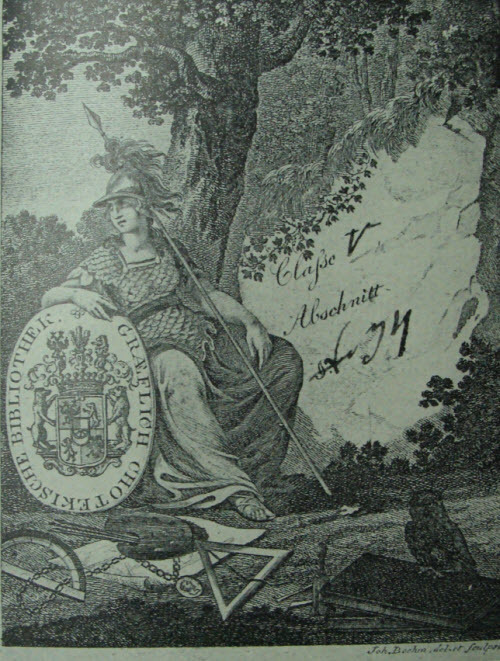 The early German book-plates as a rule are larger, bolder, and rougher than their successors in neighboring countries. Heraldry is seldom omitted, and allegorical features are common. The earliest dated plate yet found in France was made in 1574, and was in the books of Charles d�Aileboust, Bishop of Autun. It is a simple typographical label. 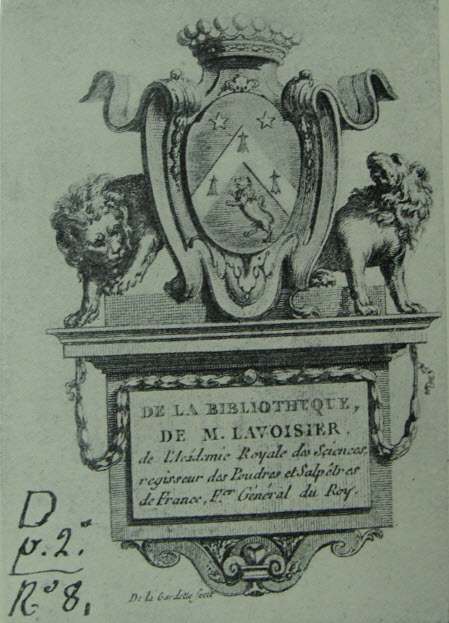 The earliest dated armorial plate was engraved by Leonard Gaultier in 1611, and was for the library of Alexander Bouchart, Vis. comte de Blosseville. French book-plates are not so numerous as the German, and the anonymous plates of the seventeenth and eighteenth centuries are difficult to identify. French heraldry is perplexing, as the early engravers did not conform to established rules with the regularity the collector deems commendable. There is considerable similarity between the early plates of Germany and France, but they are distinguishable by the marked differences in the heraldic devices of the two countries and by the manner of engraving. The French cut into the wood, while the German often cut in relief. The prints from these differently cut blocks are readily separated. French plates, as time went on, became more ornate than the German, resulting in a loss of dignity. 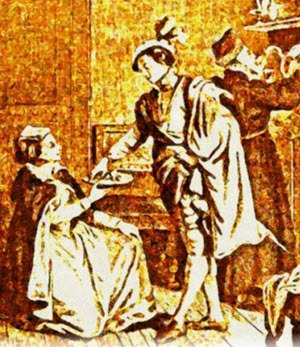 Jacques Picart, Isaac Briot, and Sebastien Le Clerc in the seventeenth century, and J. Audran. 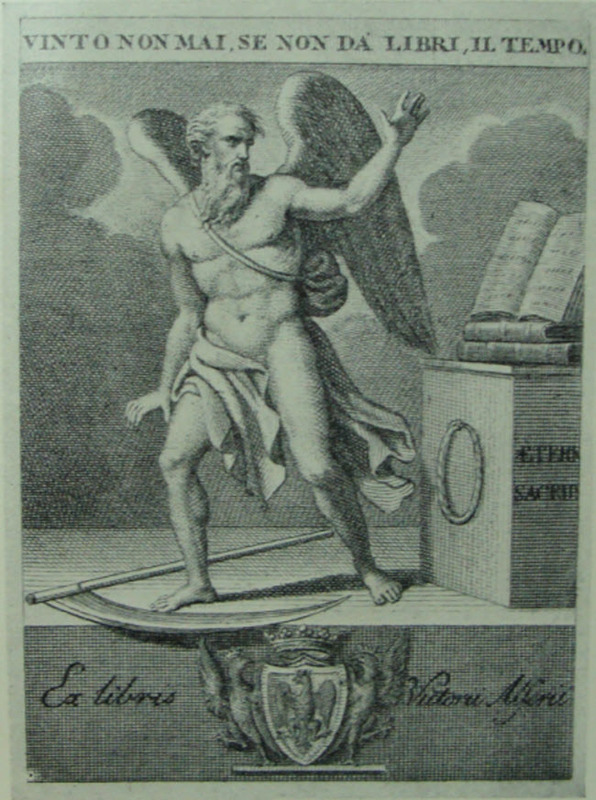 Cochin fils, Collin pere, Durand, Charles Eisen, Charles-Etienne Gaucher, Gravelot, Louise Le Daulceur, B. Picart, and Claude Roy in the eighteenth century, are among the most widely known French engravers who made book-plates. Probably the chief interest in the book-plates of France, among English-speaking collectors at least, centers in those used by the celebrities of the country. Men and women famous in state and court, in letters and art, used book-plates that are highly prized to-day. Book-plates are found in all the continental countries, but the number is not large beyond the limits of Germany and France. Sweden began their use some years after Germany. Switzerland and Italy have plates dating very early in the seventeenth century, and Spain, Denmark, Russia and Austria, the Netherlands, and Norway contribute but few early examples. altered. It is progressive, cheery, attractive. But the ornamentation of the Chippendale plate was overdone at length, and the style was succeeded about the year 1770 by the simple, severe designs known as the Ribbon and Wreath. This title quite clearly describes the style: it was merely the shield of arms inclosed in branches of palm tied with a bit of ribbon, something in the manner of the conventional victors wreath. 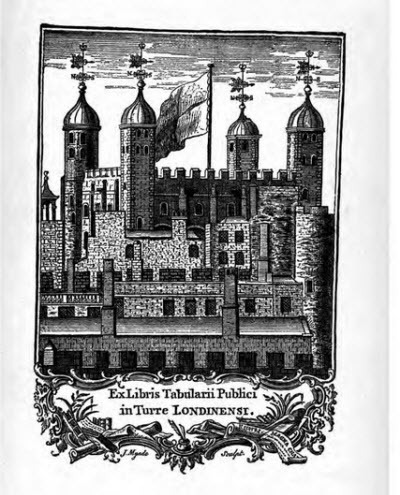 During the progression of all these styles the perfectly plain armorial plates were also in use. Gradually, too, the various styles known as the Trophy, Library Interior, Book-pile, and Pictorial were developed to suit the tastes of owner and designer. England has a great profusion of signed plates, Mr. Fincham�s list (which includes a small proportion of Americans) giving over 1,500 different engravers and designers whose names appear on book-plates. Cole, Hogarth, Kirk, Marshall, Mountaine, Pine, Skinner, Strange, Vertue, Allen, Bartolozzi, Bewick, Cipriani, Lambert, Pye, Scott, Sherwin, and Yates are among the most widely known. 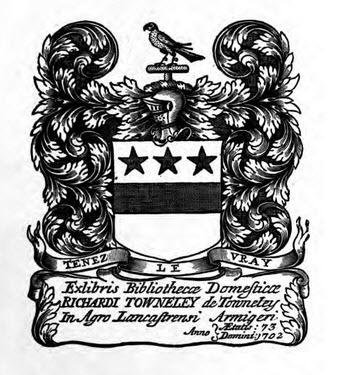 America took its book-plate styles from England. Undoubtedly the first plates in the U. S. came over already pasted into the books of some colonist bound for either the Southern or New England settlements. For some years the few that were used were made by British engravers. Early records show that orders were sent over to the London tradesmen by the wealthier colonists. The plates of William Penn, founder of the colony, and of Francis Page, of Virginia, are dated 1703, and are the earliest dated armorial book-plates used in the American possessions. Both of these were made in England. Page was a student at the Inner Temple when his was engraved; but Penn is described on his plate as Proprietor of Pennsylvania. There are several armorial plates used by colonists which bear dates previous to 1750, all of which are of English workmanship. The first American engraver to date a book-plate was Nathaniel Hurd, of Boston, whose charming plate for Thomas Dering is dated 1749. 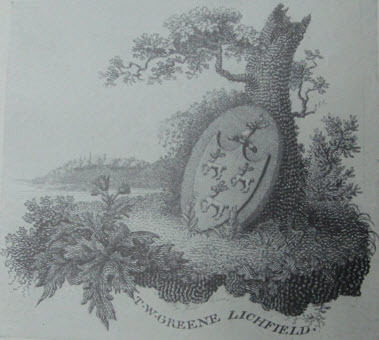 Dawkins made a plate for John Burnet in 1754, and Hard engraved one for Benjamin Greene in 1757. The little group of native engravers on copper, self-taught in the art, are a most interesting subject of research. Nathaniel Hurd was the most prolific as well as the most artistic of them all. He made plates in the Jacobean, Chippendale, and Ribbon and Wreath styles. His patrons were from the first families of New England. Some thirty plates signed by Hard are known and nearly a score more can safely be attributed to him. Joseph Callender, Amos Doolittle, Samuel Hill, Oliver Pelton, Paul Revere, and James Turner were New England engravers whose book-plates are rare and valuable. Very few plates by Paul Revere are known, and a print of the one he engraved for Epes Sargent (of which but three or four are known) sold at auction in Boston in 1895 for seventy-five dollars, the highest price, up to that time, ever paid for a single American book-plate. The plate of George Washington is naturally of peculiar interest, and not many copies are in the hands of collectors. The plate was engraved in England, and is not extraordinary in any way in itself. A very high value, however, is set upon the plate when pasted into a book once owned by Washington and having his well-known signature in its usual place on the title-page. This plate was once counterfeited, the fraudulent prints being used in an unsuccessful attempt to sell certain books as coming from Washington's library. The spurious prints are not so well executed as the genuine, and will not deceive if comparison is made. Probably the rarest American book-plate is the John Franklin, by James Turner. The New York and Southern group of engravers is headed by Peter Rushton Maverick who came to this country from England about 1774. Nearly fourscore plates signed by Maverick are known and about twenty more, though not signed, are considered his work. Other engravers in this group arc Alexander Anderson (America�s first wood-engraver), Henry Dawkins, Edwin Gallaudet, Abraham Godwin, Francis Kearney, William Rollinson. J. Smithers, James Trenchard, and John Vallance. Nearly all the American plates of the eighteenth century are armorial. Some few pictorial and a great number of typographical labels are known also. These printed labels were very common because inexpensive, and in the hands of an ingenious craftsman became quite ambitions, flowerets, ornaments, and various � sorts � being used in the composition. After the war of 1813 some American book-plates had guns, flags, trumpets, and other warlike emblems in their decoration. Although the use of the book-plate has never been entirely discontinued, it fellinto general disuse toward the end of the first quarter of this century, and the plates from 1825 up to 1890 are few and of little merit, broadly speaking. Some individual book-collectors and some public libraries made use of engraved plates, but most of them are poor in design and in execution. No general interest was taken in book-plates until the publication of Warren�s Guide, in 1880, brought them sharply to the attention of bibliophiles. In the libraries and in many private collections numbers of book-plates were preserved in the old books they originally came in, and among a very limited number some notice was taken of them. When Warren was preparing his admirable book, he had the co-operation of such sterling book-lovers as the late Rev. T. W. Carson, of Dublin, and the late Sir Augustus Wollaston Franks, of the British Museum. Mr. Carson was, indeed, the ardent coadjutor of this pioneer, and without his continual encouragement and substantial aid the book probably would not have been written. One or two others, notably Henry Peckett, the Hon. Gerald Ponsonby, and Dr. Joseph Jackson Howard, were the only persons known to take a genuine interest in book-plates. Warren, who had no small poetic gift, and who was a thorough and painstaking student, made his book exceedingly interesting. Some years previous to this publication, namely in 1822 and 1823, The Gentleman�s Magazine printed, two articles on book-plates, and in 1837 the Rev. Daniel Parsons wrote at some length on the subject in the third Annual Report of the Oxford University Archaeological and Heraldic Society. Following these, Notes and Queries had for a number of* years references to book-plates. The paper by the Rev. Daniel Parsons showed considerable study and patient research. The first known collector of book-plates as such (for many examples found their way into the big collections of prints) was a Miss Jenkins, of Bath, who began collecting in 1820. 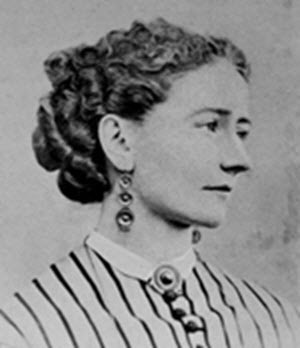 Dr. J. J. Howard acquired her collection in 1837 and has been adding to it ever since. Probably the largest collection and one of the finest that have been gathered was owned by the late Sir A. W. Franks, who bequeathed it to the British Museum. It numbered well over 100,000 specimens. The collection Mr. Carson left numbered 32,000, and was sold in 1895 for �1,150. In January, 1897, Messrs. Puttick and Simpson held the first auction sale devoted to book-plates only, in their rooms, Leicester Square, London. 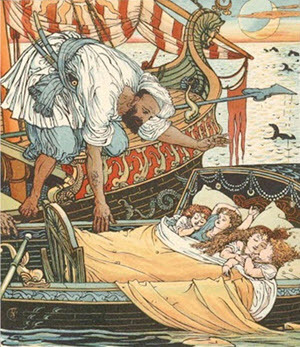 The first volume of the Western Antiquary, edited by Mr. W. H. K. Wright, and published in 1881, contained an illustrated article on the book-plates of Francis Drake. In each annual volume of this magazine thereafter articles on the spreading hobby of book-plate collecting may be found. In 1890 the Book-Plate Collector�s Miscellany was started as a supplement to the Western Antiquary, but within a year it was merged with the Journal of the Ex Libris Society, the official organ of the newly founded association of book-plate collectors. With the foundation of this society the present renascence of the book-plate may be said to have begun. When Warren�s book found at length a good circulation among bookmen, a wonderful interest in book-plates sprang up, not only in England, but on the Continent and in the U. S.
In 1886 Mr. Laurence Hutton wrote articles for the Book Buyer on early American book-plates, and in the same year Mr. Richard C. Lichtenstein contributed a list of early New England and New York plates to the New England Historical and Genealogical Register, In 1881 the Rev. Joseph Henry Dubbs had reviewed Warren�s book in the pages of Boston�s Literary World. The late James Eddy Mauran, of Newport, R. I., and the late Henry F, Sewall, of New York, were the earliest collectors of book-plates on this side of the Atlantic. Mr. Mauran�s collection numbered about 3,500 at his death in 1888. This collection had a most interesting history. A large part of it is now owned by Mr. H. E. Deats, of Flemington, N. J. The Sewall collection was sold at auction in 1896-97 along with the library Mr. Sewall left when he died. The first public exhibition of book-plates in the U. S. was made by the Grolier Club of New York in November, 1894. Since then the Rowfant Club of Cleveland (1895), the Caxton Club of Chicago (1898), and the Club of Odd Volumes of Boston (1890 and 1898), besides many smaller societies, together with booksellers and artists, have held exhibitions in many cities. In 1896 the Washington Book-Plate Society was founded. In 1897 it was made national and the name was changed to the American Book-Plate Society. Four numbers of an excellent quarterly were published in 1896-97. The publication was then discontinued and the society is now dormant. The first auction sale in this country devoted to book-plates alone was held by Messrs. C. F. Libbie & Co., in Boston, in February, 1897. From being an almost unconsidered trifle, the book-plate has come to exert a strong influence upon the price of books offered at auction, and the sale catalogues usually refer to the good plates in the books offered. The dealers in old books regularly mention the plates their stock contains in their periodical catalogues. Pn consequence of the recent revival of the book-plate, the collector now classes as �old� all plates made previous to 1880, and those dating before the present century are �early.� The interest in the study of the plates of bygone years that Warren�s book incited led naturally to the widespread adoption of the book-plate among the bookmen of today. Many fine plates have been made in the! last decade, and the languishing arts of engraving and etching found in the new hobby unexpected encouragement. In England the best-known engraver is Mr. Charles W. Sherborn; the leading etcher is Mr. G. W. Eve. In the U. S. Mr. Edwin Davis French is the foremost engraver, Mr. W. F. Hopson leads as cutter in wood, and Mr. J. W. Spenceley is the best-known etcher. The modern cheap methods of photographic reproduction may be held responsible for the great flood of book-plates the last few years have seen. The designs of greatest merit in this line have come from the studios of Mr. Edwin A. Abbey, Mr. R. Anning Bell, and Mr. Walter Crane in England, Mr. George Wharton Edwards and Mr. Thomas Brown Hapgood, Jr., in the U. S., and Hen* Joseph Sattler in Germany. 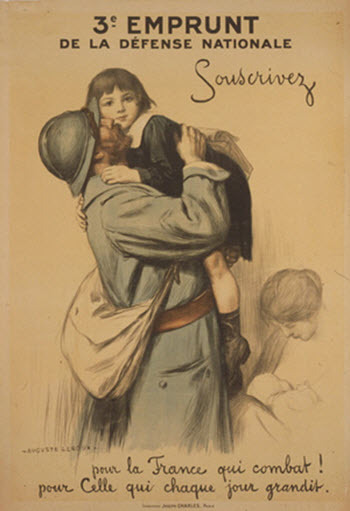 Hundreds of inferior designs are issued today which plainly show the debasing influence of so-called poster-art. 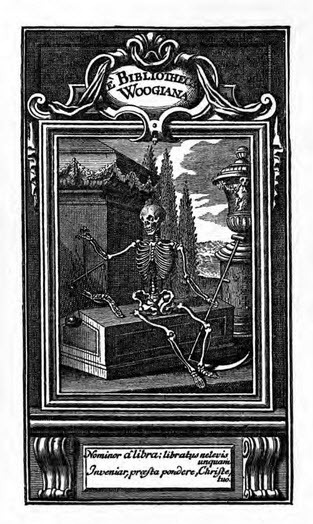 A Gloomy German Book-Plate - A Skeleton Sits on a Coffin Shaped Tomb. The Latin inscription is a play on words between the Latin for scales and the book owner's name, invoking diving mercy when his soul is weighed in the after life. 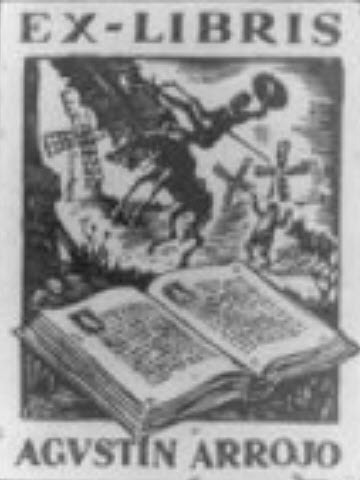 In addition to the Ex Libris Society, founded in London in 1891, which is thoroughly cosmopolitan in its membership, limited strictly to 500, there are two other societies of international importance. Des Ex-Libris-Vereins zu Berlin was established in 1891 and issues to members an illustrated quarterly magazine. The Societe Francaise des Collectionneurs d'Ex Libris was organized in 1898. Its Archives are published monthly. The English society also issues a monthly journal. The literature of the subject has grown very fast during the last eight years. Many privately issued monographs, now rare, and many articles in periodical literature would find mention in a complete bibliography. The works named below furnish, however, a fairly complete list of the authorities accepted by collectors. 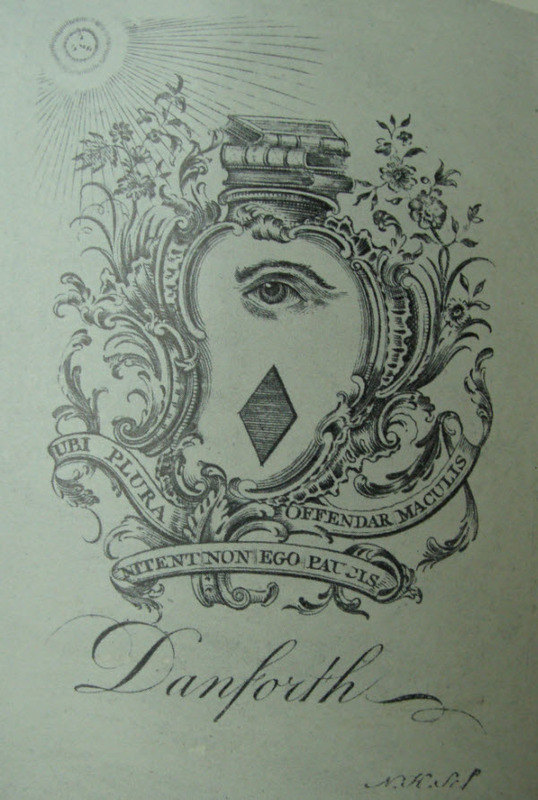 A. Poulet-Malassis, Les Ex Libris Franpais (Paris, 1875); the Hon. J. Leicester Warren (the late Lord de Tabley), A Guide to the Study of Book- j Plates (London, 1880); C. M. Carlander, Svenska Bibliotek och Ex Libris auteckningar (Stockholm, 1889); F. Warnecke, Die Deutschen Bucherzeiclien (Berlin, 1890); Joannis Guigard, Nouvelle Armorial de Bibliophile (Paris, 1890); Henri Bouchot, Les Ex Libris et Les Marques de Possession du Livre (Paris, 1891); Egerton Castle, M. A., F. S. A., English Book-Plates (London, 1892); Walter Hamilton, French Book-Plates (London, 1892); W. J. Hardy, F. S. A., Book-Plates (London, 1893); Charles Dexter Allen, American Book-Plates (New York and London, 1894); Miss Norna Labouchere, Ladies' Book-Plates (London and New York, 1895); Walter Hamilton, Dated Book-Plates (London, 1896); Henry W. Fincham, The Artists and Engravers of British and American Book-Plates (London, 1897).